The Morning Edition story about Anacostia which riled some locals. 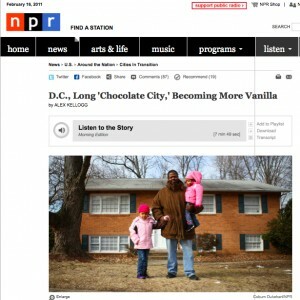 Yesterday, NPR’s Morning Edition aired a piece about how Washington, D.C. is changing: “D.C., Long ‘Chocolate City,’ Becoming More Vanilla“. The segment was taped in Anacostia, and if social media is an accurate way to gauge local reactions, this highly-anticipated story dismayed and disappointed some listeners who live in Chocolate City. While the racial makeup of D.C. is changing (everywhere– not just east of the river), some D.C. residents worried that the story showed an incomplete picture of a community which already struggles with how it is stereotyped and viewed. Did journalist Alex Kellogg go to Anacostia with a predetermined narrative in mind, which he padded with formulaic soundbites? A black resident is forced out. A young white gentrifier takes his place. People are robbed and pistol-whipped in an “edgy”, poor, black part of town. As the night unfolded I was most frustrated that this happened in the presence of my guests, and that they would no doubt think differently about a neighborhood that they had grown comfortable with. That’s right. Garber wasn’t worried about his safety or that he was a target– he was concerned that people who were already hesitant to visit him in Anacostia had just had their worst assumptions validated. And that’s the biggest complaint I saw yesterday– that Kellogg’s story conveniently confirmed the worst stereotypes about Anacostia. The fact that the story aired on Morning Edition, a respected program which thoughtful people trust for a nuanced take on the news only made it that much more powerful– and painful. I called Garber yesterday, and spoke with him about Morning Edition, how he was portrayed and what he thinks about gentrification. He had quite a bit to say. It was a very typical understanding of this neighborhood and neighborhoods like it. It’s unfortunate that a platform such as Morning Edition was used for such lazy journalism. Well, it wasn’t a story about (Robert Adams) being priced out of the hood, it was the story of a guy who decided to buy a big house in PG county because he didn’t feel like living in Anacostia anymore. The reporter was trying to write about his impressions instead of reality. But isn’t the reality that there is some displacement? Yes. There are some people who have been pushed out of this neighborhood, sure. That is true, but I also think other parts of this story were left out or weren’t really told. The story ended up being about race whereas the story in Anacostia right now is about class. Most of the people moving here are black. It’s not a giant wave of whites in, blacks out. Anacostia’s racial history is choppy anyway, it was black for the past 50 years and before that it was white. So it’s about class, not race? Cities are adjusting themselves to people’s desire to live in them, that includes D.C. in general and Anacostia specifically. Generations X and Y want to live in the city, so we are seeing rightsizing…I don’t see how it’s a bad thing. For me, the story couched gentrification as something that is inherently negative, that negatively impacts neighborhoods and people who have been in them for a long time. And you disagree with that definition of “gentrification”? My experience with it is that it’s a lot more nuanced than that. In Anacostia and neighborhoods across D.C. there are people who’ve been here a long time, who are excited about infrastructure improving, cleanliness happening, neighborhood improvement. It’s problematic to argue against neighborhood improvement because you’d be advocating for the status quo. Tell me more about your involvement with the Morning Edition story. I agreed to be part of the story because I was trying to see if I could help broaden his understanding of what’s going on east of the river. One of the first things he talked to me about was the break-in at my house…which was something that didn’t really define my experience in this community, at all. In reality, I moved out months after that happened for unrelated reasons. The break in occurred in December of 2009. I left in August of 2010. And I moved out because of roommates, my lease. Even after I corrected him a few times over email, and after the story came out…he treated it like he still believes that’s the reason why I left. His response was, “We were very careful about not saying that’s why you left.” For me, I hate even talking about the break-in because it was so irrelevant to my experience in Anacostia. It was one negative thing, but I had all these positive things that balanced it out. I didn’t see any reason to focus on it. Stuff like that can happen everywhere. I was not targeted. The people who broke in came in a car. They could’ve been from anywhere. It was an outlier of an experience. And yet, if someone asked me about you or your blog, that break-in is the first thing I think of– specifically how you were concerned about how people would look at Anacostia after learning about it, after all of your attempts to present it in a different light. That was a memorable blog post. I’m the first to admit Anacostia is not the most awesome neighborhood right now, but my goal has always been to do that. The negative press is already out there, so my goal was to add a positive perspective to the mix. I’m never going to say Anacostia is perfect right now. I know it’s not perfect. I also just know that it has potential and a lot of people are interested in seeing it improve. No wonder you were so frustrated. From the very beginning, I knew what story was trying to be told. My goal was to shape it away from that in some ways. There’s always the shock story, one population moving in, one being kicked out…that’s not what’s happening in Anacostia right now. It’s too bad that’s the story that was told. If you look at who’s moving in, it’s a lot of professional blacks in their early to mid 30s. Gentrification doesn’t always mean racial displacement. I’ll be the first to stand up and say that I support more economic diversity in neighborhoods that are not economically diverse right now, and if that means gentrification, then we need to figure out what’s so horrible about it. Without gentrification, we’re left with pockets of poverty and food deserts; I don’t think that’s what we want. Do you still live in Anacostia? I lived there for 3 years, until last summer. Now I live across the river near the ballpark. I have my feet on both sides of the Anacostia river, in some ways. Are you from D.C.? What drew you to Anacostia? I grew up in Northern Virginia, so I’ve been in and around D.C. my whole life. When I started looking in D.C., to either rent in a nice neighborhood or buy in a less nice one, I came across Anacostia. I started believing in its potential. Everyone has their angle, I want Anacostia portrayed a certain way…and this reporter wasn’t trying to seek out representative stories, which just made it seem like a cheap shot. It was an opportunity squandered…communities east of the river are places to trash. Some want to keep it that way…we kind of like having these places where we’re able to see the ruins of society and not offer any solutions or hear any true stories. This David Garber person is just peeved that the NPR piece doesn’t flatter him much. He’s probably upset that he comes off looking like yet another overprivileged white carpetbagging suburbanite-turned-urbanite real estate opportunist. David, Thanks for all you’re doing in the neighborhood. It seems as though we’re fighting an uphill battle, but I believe it will all be worth it in the long-run. Yay for the *whispers: white man* who wants to make sure people know he’s not a racist. Truth is, no matter how much you contend against gentrification having a negative connotation, it will not change the fact that it is negative. You argue that without it we would have “pockets of poverty,” but I’m sure you’re intelligent enough to realize that once the rich move in (the only ones who can afford the lovely new landscape), no matter the color of their skin, the poor must move out. This forces them to other areas in near by Prince Georges county where these “pockets of poverty” will continue to deepen. You AREN’T a superhero. You AREN’T an advocate for change, but rather and advocate for preventing the defamation of your own character. Please get hip before the next time you decide to pat yourself on the back. I caught most of the story, and found it ballanced. It seems like many people instead wanted a puff piece. There are pros and cons to gentrification. Everyone wants a new supermarket in their neighborhood. Nobody wants to be forced out because the cost of housing went up (well, renters don’t like it. Homeowners, who choose to sell are presumably happy at the increased prices). In every transaction, there is a buyer AND a seller. Even IF he did move because of the break-in, can we blame him? I also don’t understand the negative conotations of “gentrification”. Heck, Detroit Michigan DESPERATELY needs gentrification but nobody’s willing to move there. I propose huge tax breaks for any small business or big corporation who moves to Motown bringing workers and their famlies with them. Cheap housing, cheap land, abandoned factories – Detroit has it all. How can we get people to gentrify this Godforsaken place? Just see what happens when no gentrification takes place – you end up with Detroit. i didn’t move out because I got robbed — it was because my lease was up. yeah. oh – across the river? yeah – it’s nicer the….errrr, i mean i won’t get robb….errrr, i mean, no, it’s no problem, i could have stayed, but you know, i just decided to move across the river. why? oh, you know, just because there was like a _really_ great opportunity there. and, well, you know, i’m life-long baseball fan — go Nationals! haha. The guy’s comments show a distinct lack of class (what’s so horrible about gentrification?? ), and his unfounded attack on NPR – one of the few remaining meaningful outlets of public participation on the airwaves in America today — at a time when it is under sustained assault, shows just how selfish some people can be. i’ve never been prouder than this moment that i’m _not_ a resident of DC. y’all can have this dude. I hope I never get this cynical. It seems like such an unhappy life. Kudos to David and all of us (both newcomers and old) who live and work in East of the River neighborhoods like Anacostia, Congress Heights, Barry Farm, Washington Highland, Fairlawn, Deanwood, etc. and who give every single last thing we have (and then some), selflessly, often late into the night because we love our neighborhoods and want them to succeed — for all of us. The life of a big bad “gentrifier” in East of the River is often filled with lots of work, little to no pay, crushing debt (because of that little to no pay), and an unwavering belief that it’s somehow, someday it will be worth it. If people had a clue about how much we all sacrifice. I don’t say that to solicit sympathy but so people would stop accusing people like David of trying to make a buck as opposed to believing he really is one of those really nice, really honest, and really optimistic people who believe that change starts within. Good job David — we know the truth. P.S. And for those people who for some reason think things like this matter. I’m black and I moved to Ward 8 four years ago when I purchased my first home. Turn it back into the creative/music mecca it used to be. See: Austin, TX; sundry cities/towns of the PacNW. If I were filthy rich, I’d like there to be nearby “colorful” districts chock full of scrappy bohemian hobos, semi-nomadic jazz musicians, and the like. I would fling my spare Sacajaweas at said denizens in exchange for flava’d funk and raw streetwise riffage. But maybe that’s just me, having grown up around too many riche-gauche MoCo mofos. ahem…it should be noted that the area David moved to is not necessarily any “better” of a neighborhood than Anacostia. Just a few short years ago the area where the ballpark now stands was full of seedy nightclubs and a place you wouldn’t go alone at night for fear of being mugged or, worse, murdered. The new stadium improved (“gentrified”?) the area, just as many people (black and white) are trying to do with Anacostia, Barry Farms, etc. The ballpark area is still considered by a lot of people to be an iffy area…one two think long and hard about when moving…is it really safe? I know because when I was moving in October it was one of the places I looked. This bit by Nikki is very well stated. Kudos! “The life of a big bad “gentrifier” in East of the River is often filled with lots of work, little to no pay, crushing debt (because of that little to no pay), and an unwavering belief that it’s somehow, someday it will be worth it. I work in Anacostia and have had the privilege to work alongside of Nikki Peele, David Garber and Stan Voudrie on several projects. Nikki, David & Stan are two of the hardest workers I’ve ever met. In a day and age where workers are getting lazier and less dedicated, this should be praised. Even more praiseworthy to me is that they aren’t just working at a job, they are working for something … the community. I see these three walking the streets of Anacostia every day. Walking from business to business, talking to other locals on the street, promoting community togetherness and working their hardest to bring more economy into the area. I’ve worked late myself and still managed to leave before Nikki! I have to say I don’t get why anyone would be upset about improving a neighborhood…whether it’s called “gentrification” or something else. Fixing-up broken down houses, chasing out drug dealers, bringing in non-profits and charities, etc. are things that are done to help the people that live here, not hurt them. Yes, these things make the neighborhood more attractive to outsiders moving in, but, first and foremost, they are for the people that already live and work here. As for making this about race…that’s preposterous. People have better things to worry about than that. Real estate figures have been rising fairly steadily all over the DC metro area for the 9 years I’ve lived here. The cost to buy a home has doubled, and, at times, tripled, everywhere in this area. It’s not just Anacostia. There are a variety of social and economic factors that lead people to move from one place to another. Being a 30 something professional I can tell you that most of my friends are at an age where they want to buy a home, but can’t afford even a town home in some of the “nicer,” more popular areas. Instead, they have been looking at places either further away (with a longer commute) or closer to DC in a “fixer-upper” in an evolving neighborhood (to have a shorter commute). This is true whether they be Black, White, Hispanic or Philippino. Next time you want to trash people for trying to improve the neighborhood, you should first consider getting off the couch and doing a little community service yourself. Ahhh! I just saw this! Thank you for the kind words! I wish I knew who this was so I could give them a hug — please feel free to randomly hug me next time you see me on the street. I am sure I could use it. lol. I had to login to see your screen name. I know who this is now and you get a cookie for being so sweet. You are awesome yourself! lol.